Mr Bijen Patel is a fellow of the Royal College of Surgeons of Edinburgh and has obtained training in General Surgery as well as higher specialist training in Laparoscopic and Upper Gastrointestinal Surgery. He pioneered the Masters course in Surgical Skills and Sciences at Queen Mary, University of London and has set up a "Virtual Reality Surgical Simulation Centre" for training surgeons. 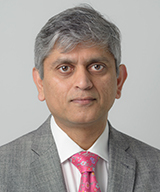 Mr Patel is a fellow of the Royal College of Surgeons of Edinburgh, he graduated from the University of Bombay in 1989 and has obtained training in General Surgery and higher specialist training in Laparoscopic and Gastrointestinal Surgery in the UK since 1994. He was awarded the "Certificate of Completion of Specialist Training" in 2004 by "Specialist Training Authority" representing the four Royal Colleges of Surgeons in UK. Mr Patel is the course director for the Royal College of Surgeons Basic Surgical Skills Course, Laparoscopic Surgery Course and Masters (MSc) in Surgical Skills and Sciences MSc course at Queen Mary University of London. As a director he is involved in the delivery, quality assurance and quality enhancement of this course. Mr Patel is world leader in establishing higher education degrees for acquiring operative surgical skills by simulation. He pioneered the Masters course in Surgical Skills and Sciences at Queen Mary, University of London and has set up a "Virtual Reality Surgical Simulation Centre" for training surgeons. The course employs novel techniques in the education of surgeons, using computer simulations to enhance the surgical skills. He is also on the faculty at the Royal College of Surgeons for teaching laparoscopy skills.